As solar roofing emerges as an evolving sub-sector of the industry, there are a lot of misconceptions and flaws in many existing business models. For example, if you are a residential homeowner that has been looking for information about Solar Roofing / Solar Systems installed on the roof, we have yet to see a model that points out all the information. Like the most simple fact that, when you have an asphalt composition shingle roof (4 out of 5 homes by statistic) which is already starting off with a net building envelope efficiency loss of – 15% to -20%, if someone says they can reduce your energy bill by installing a Solar System that is Roof Mounted, there is a lot more to it than many people make it appear. For example, if you live in a house built before 2008 when Houston Adopted their Energy Code, then most likely there is more to making things work than just installing a Solar Roofing System. Consider this, when you counter the net sustainability loss of 15% to 20% with your average Roof Mounted Solar Array that has an average net gain of up to +20%, in the end, you essentially end up with a wash or a true net gain of 0; assuming you have an Asphalt Shingle Roof with the original R 18 Insulation beneath it, and we have not even examined if your ventilation is balanced. Sure, if installed by experienced professionals, there is a 30% tax credit. That’s right – 30% of the total cost for the system to be installed. However, when thinking about Solar, you have to think about all the pieces of the puzzle, The Roof Type, (if Roof Mounted), The R-Value Beneath the Roof and the NFA / Net free area of balanced ventilation. After you have considered all of that, you can start the process by assuring that everything is where or as close as it needs to be. If you take the time to consider those things, not just what some Sales Person is telling you and by carefully planning and taking into consideration every variable possible that affects the building and making whatever corrections need to be made to be as efficient as possible, then you will be sure that you can maximize your gains and efficiency. While the upfront cost will be higher, the long term Return on Investment will be offset greatly during the Life Cycle of the Solar Roofing System. Moving on, is installing Solar Modules over Asphalt Shingled systems wrong? It is not. However, unless the potential buyer understands what net gain and net loss is from the Asphalt Based Roofing System and if the Solar Array is installed on top of it, then they may not be maximizing the gains or the return on the investment. That is commonly referred to as “ROI” (Return on Investment), and unless one part of that equation or system includes increased attic Insulation to offset the Net Loss from the Asphalt based underlying Roof System and it is verified that the Attic already has an R30 value, then there are issues that we recommend working out . There is also the possibility that Companies that Jumped on the Solar Band Wagon without completely understanding the building envelope efficiency promoted more than what was actually provided. That kind of companies could very easily cross the wrong person who could potentially decide to seek resolution via DTPA Litigation, (Deceptive Trade Practices Act). One other potential flaw is that the majorities of the companies installing Roof Mounted Solar Systems are Electricians and not roofers, and may not be aware of the fact that for the numbers to work, you need a roof assembly with a 20 to 25 year life cycle. Because, if a Solar System is installed on a Roof System with less than a 20 to 25 year life cycle, it is inevitable that the structure will require re-roofing which will create additional costs down the road when everything may need to be re-installed. The Roof Consultants Institute, RCI, explains the concept of upgrading a Commercial Roof System to a 30-year System in their post Called, “Go Big.” By following the concept and having a Commercial Roof that can be covered by a 30 Year NDL (No Dollar Limit), total system warranty is, in the end, the best fit for Commercial Real Estate Investors, as well as System Designers to design a roof system that is ECO friendly, and does not cause a loss in building envelope efficiency as they illustrated in easy to understand context. They explain why spending extra money up front creates the best possible scenario for long term performance of both the Roof and the Photo Voltaic Systems, or as we have been referring to them, Solar Roofing. Photo Voltaic Roof Array installed over a Metal Roof System. Commercial and Residential Owners looking to acclimate to clean Renewable Solar Energy have many great resources to get adequate help on anything from Legislative Acts to an incredible Overview of Photo Voltaic integration as well as many incentives that are available. Go to the link below to find out more about this program. 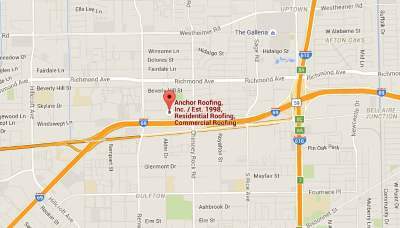 Anchor Roofing is all for promoting Solar Roofing in Houston and is endeavoring to implement the best business model possible that explains all the pro’s and con’s that many people looking to integrate may not fully understand. With a focal point on what to do to see the highest gain and what is the best design for the roof assembly, as well as the possible Photo Voltaic System that can go on top of the first one, what system is the best possible scenario to maximize your gains, with a myriad of options from established Solar Manufacturer’s, and not just one option, see the full intended life cycle as well as understanding that different families have different Energy Consumption. And while a Large System may be ideal for some families or businesses, and you may be able to purchase a system that can literally negate your need for an outside power supply, you most likely may not be able to sell back whatever extra energy you produce back to Renewable Energy Providers for what the end user pays per Kilowatt Hour. The Carbon War Room is another excellent site that offers information for Citizens, Entrepreneurs, Investors, and Manufacturer’s as well giving a perspective on how Photo Voltaic System reduces the Carbon Foot Print and significantly helps the environment. Understanding that the more the consumer knows, the better decisions they can make, is our primary goal. Solar is here; however as Sir Winston Churchill said, “A goal without a plan is merely a wish.” We want to help you plan, and the first step is to provide you with as many resources as possible to give you the best understanding of the rapidly evolving market. We thank you for taking the time to read this article, and can only hope that the shared resources and information help acclimate you to a position where you make a decision that is fact based and not empowered by a Salesman just out to make another sale, but by an educated consumer that understands what is the best fit for your Photo Voltaice Solar Powered System. We look forward to being able to provide more updates, we know what it takes to properly install Solar roof on your Home or Commercial Business anywhere in Houston metro area, and we have affiliated ourselves with the best Photo Voltaic Providers in the Houston Market, that have a myriad of options and can take care of the Photo Voltaic System from A to Z, while we assure that in the process, your roof is a good candidate and that when the System is installed, any possible Roofing Warranties you may have remained valid. We welcome the challenge of looking at your house or building, evaluating all pre-existing conditions, bringing the best Solar Installers to you that are properly credentialed in Solar, as we are in Roofing. So when you apply for your 30% tax credit for the total cost of the system, you won’t have any issues.